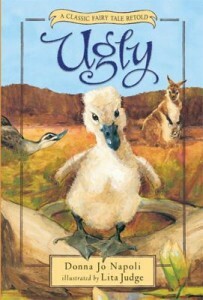 This children’s book offers a thoroughly lovable Ugly Duckling, who of course in the end discovers he is a swan. However, this version is nothing like your standard fairytale. Instead, we discover what life is like for the Ugly Duckling as he is kicked out of his family and has to fend for himself. Life is not easy for a duckling on its own in Australia, with winter coming, but this little duckling has a good head – his mother said he was a genius, though he discovers that is quite debatable. The offering that this children’s book makes is related to the repeated theme of befriending others, no matter how different they may be from you. The duckling goes through a series of friends, from wombats to humans, and learns discrimination along the way. As we wander with Ugly, we also gather a trove of information about the animals and birds he encounters. There are so many ways to use this children’s book. It occurred to me that it would be wonderful to use in the Waldorf 4th grade Animal Block, especially in Australia, but anywhere else as well. It is also a terrific children’s book for a somewhat melancholy child. You can’t help but become sympathetic with every twist and turn that Ugly goes through. Be warned that there is a difficult moment when he encounters hunters, and you may need to help your younger child deal with it. I prefer this book for 9 and up, but some 8-year-olds could enjoy it quite well.